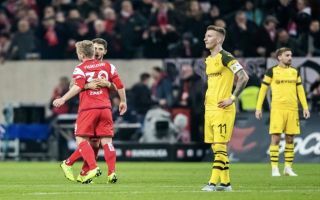 Fortuna Dusseldorf secured a 2-1 home win against Bundesliga leaders Borussia Dortmund, with Jean Zimmer grabbing a memorable goal. Dortmund came into the match unbeaten after 15 matches of the 2018-19 campaign, but goals from Dodi Lukebakio and Zimmer condemned BVB to their first defeat. Paco Alcacer grabbed a late consolation for the visitors, as Zimmer’s wonder-goal ended up being the winner on a night of high-drama in the German top-flight. The 25-year-old right-back picked the ball up on the edge of the box and quickly set himself before rifling home an unstoppable effort into the top-left hand corner, which sent the home faithful into raptures. Check out the amazing strike below, via Twitter.